Washington Gov. Jay Inslee speaks in support of firearm restrictions in 2017, as his wife, Trudi, looks on. The initiative passed, but some Washington state sheriffs are refusing to enforce all the measures. Last fall, voters in Washington state approved a package of firearms restrictions, generally called I-1639. It raises the minimum age for buying semi-automatic rifles, tightens background checks and makes it a crime to fail to store a gun safely, if the gun ends up in the wrong hands. The restrictions have raised the ire of some county sheriffs. "My plan is not to enforce it," says Klickitat County Sheriff Bob Songer. Songer is one of about a dozen sheriffs, mostly in rural parts of the state, who have come out against the law. Some say they will apply certain measures — for instance, the background checks — but will ignore others. One sheriff said he is not going to arrest a 20-year-old farmer who happens to have a semi-automatic rifle with him on his tractor. Songer is more absolutist. "As an elected sheriff and a constitutional sheriff, I believe it violates the Second Amendment of the U.S. Constitution," he says, "and, more specifically, violates the Washington state Constitution." Songer adds he won't enforce it unless — and until — the Supreme Court says it is constitutional. Does a sheriff really have the right to do this? Robert Wadman, a former police chief and a professor emeritus at Weber State University, says professional discretion is a constant feature of policing, as cops decide, for example, whether to arrest someone for simple drug possession or wait to see if they can follow the little fish to a bigger drug dealer. "There's a litany of decision-making processes in almost every phase of policing, from the street to the leadership," Wadman says. While he believes there's no "recipe" for figuring out when discretion crosses an ethical line, he thinks publicly refusing to enforce a law on constitutional grounds goes too far. "I would not go down that path," he says. He thinks the Washington sheriffs' motivations are political, and he says, "For me, questions of this nature should be answered by the courts — not the court of public opinion." Richard Mack, on the other hand, says the Washington sheriffs are doing their duty. Mack is a former Arizona sheriff who in the 1990s successfully challenged a federal law requiring state officers to do gun purchase background checks. Since then, he has popularized the term that Songer uses to describe himself, "constitutional sheriff." "Sheriffs standing for freedom have the responsibility to interpose — it's the 'doctrine of interposition' — whenever anybody is trying to diminish or violate the individual rights of our counties," Mack says. Mack runs an organization called the Constitutional Sheriffs and Peace Officers Association, which has offered courses in this line of thinking to law enforcement officers. Mack won't disclose the names of sheriffs who have joined the association, so it's hard to gauge his influence. "It is a thing that exists," says Mirya Holman, an associate professor of political science at Tulane University who has studied the attitudes of hundreds of sheriffs around the country. She says many are aware of Mack's doctrine, but their adoption of those ideas varies. "There are sheriffs that endorse this; there's also, though, a lot of sheriffs that wouldn't fully endorse it but like some of the ideas that are contained within it," she says, such as the notion that federal authorities should notify local sheriffs whenever they perform law enforcement in that county. Holman says the "constitutional sheriff" idea is fed by the political polarization in Western states — the Washington gun initiative, for instance, was passed primarily by voters in metro Seattle. "Sheriffs are seeing laws being made potentially by voters in urban areas and feeling like they need to protect their population from these people who have very different attitudes about the way the world should be," Holman says. Others point to more sinister roots for the phrase constitutional sheriff. Jared Goldstein, a professor at Roger Williams University School of Law, has written extensively about popular ideologies of this kind. "It dates back to a movement from the '60s and '70s called the Posse Comitatus movement, that itself came out of the Ku Klux Klan," he says. "That isn't to say that there's a moral equivalence to the Klan and these constitutional sheriffs. But the idea that they can refuse to enforce laws that they disagree with is just the same." Mack, the former Arizona sheriff, rejects that analysis. "He's full of baloney and he obviously does not know me," Mack says. "Because that is not where this comes from." Mack says his ideas would encourage sheriffs to refuse to enforce any law that violates civil rights — including the Jim Crow laws of the segregationist South. Ideologies aside, elected sheriffs have extraordinary freedom to pick and choose which laws to enforce. "They have an enormous amount of autonomy," says Holman. "I'm not sure that there is another office that is a common office that has anywhere like the level of autonomy that sheriffs have." The notion of an autonomous, elected law enforcement chief is uniquely American, and some wonder whether it still makes sense. Last year, an analysis of the institution of sheriff in the Virginia Law Review by James Tomberlin concluded that the office of elected sheriff had outlived its usefulness. "What perhaps made the sheriff attractive during westward expansion makes it obsolete at best and dangerously anachronistic at worst today by preventing local governments from acting as a meaningful check on the office's powers and holding the sheriff accountable," Tomberlin wrote. Few states have curbed sheriff autonomy. One exception is Connecticut, where voters in 2000 eliminated the office of "high sheriff" after a series of scandals. In Washington state, the sheriffs' autonomy is largely unquestioned. The only option for supporters of the new gun law is to call for the sheriffs to be voted out of office in the next election. The Democratic attorney general, Bob Ferguson, sent the sheriffs an open letter warning that they might be held liable — that is, sued by a private party — if their refusal to conduct background checks resulted in a gun crime. 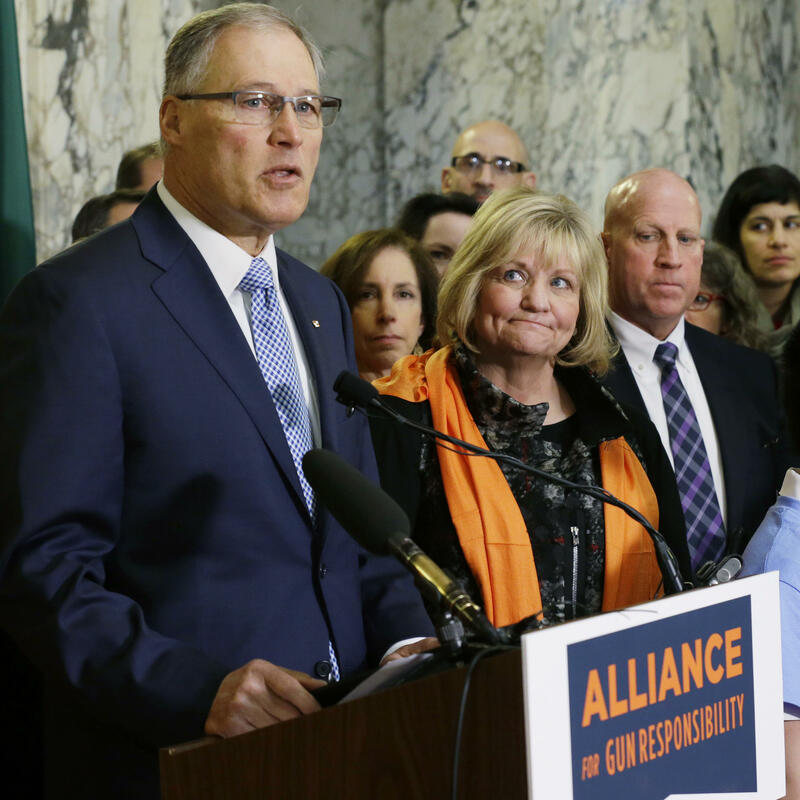 The Democratic governor, Jay Inslee, accused the sheriffs of "a futile kind of grandstanding," and he told them to leave it to the courts to decide whether a law is constitutional. But he also tacitly acknowledged his lack of authority over them, by saying he will tell the State Patrol to enforce the law in counties where the sheriffs won't.